I know it's been a while since I've shared a good baking post with my readers, I've been insanely busy trying to avoid eating baked goods while sitting constantly on the computer. 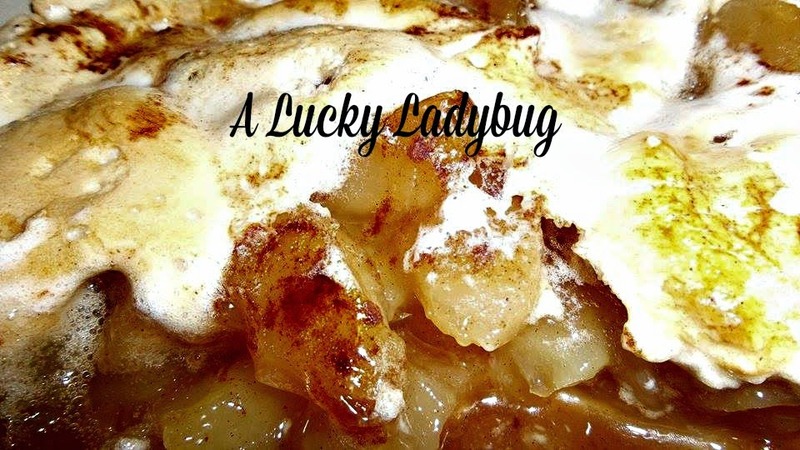 Rest assured, I am still obsessed with Lucky Leaf Pie Fillings and am continuing my ambassadorship with them! While this is the holiday season where you would normally find me baking up a storm, I haven't quite started it yet. I've got big plans for the coming weeks which I will definitely try to share any new recipes. But for now I have a quick pie recipe which was discovered almost on accident! I knew my family would be expecting something delicious created with my Lucky Leaf pie fillings for our Thanksgiving Dinner. However, time had been running out as well as my stock in other baking supplies. So one of the nights before the holiday (after quite a few adult beverages), I decided to get creative with what I had in my pantry. I came up with my own recipe - Marshmallow Apple Pie! This will be one of the easiest and best pies you've ever made. Press crust into pie tin. Then spoon mix spices, sugar, and alcohol together until well combined. Spoon into pie crust and top with tons of marshmallows (for the top crust). Cook 15-18 minutes @350 or until marshmallows begin to darken. Wow! 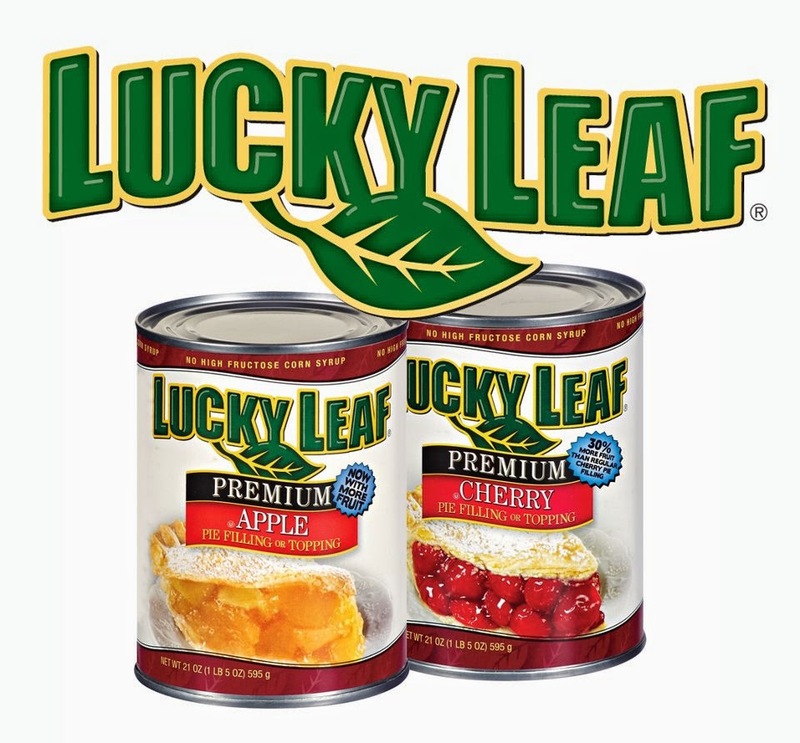 I just love how well the Lucky Leaf fillings compliment just about any recipe. This was extremely messy as a heads up when it comes to scooping slices out of the pie. However, it was amazingly gooey and while it may not look pretty on your plate, everyone loved it! 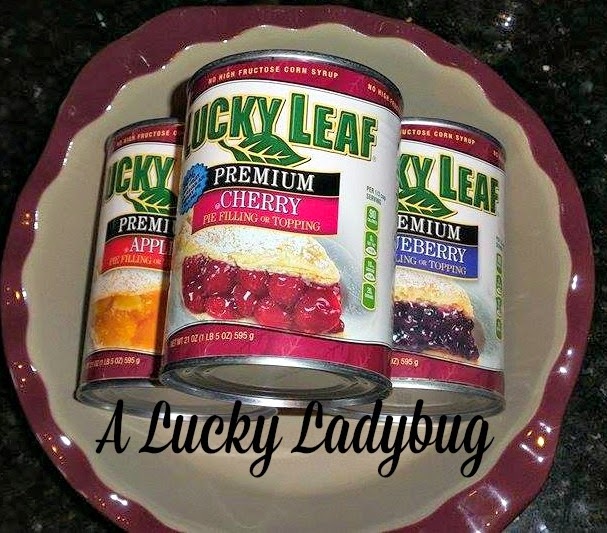 Giveaway: Lucky Leaf is going to give one of A Lucky Ladybug's lucky readers a gift package including a can of Lucky Leaf pie filling, recipe cards and a deep dish pie plate to have of their own of their own! I love cherry pies, so I would love to try the Cherry Almond Crumb Pie. I would love to try the Red Raspberry Cream Bread with Fresh Lemon Butter which features the red raspberry pie filling. I would love to try the Sweet Cherry Gianduia Parfait---looks delicious and beautiful for the table. Would like to make the Strawberry Slow Cooker Scoop Cake. I would like to try the Sugar Dusted Apple Bundt Cake using the apple pie filling. I love bundt cakes and by adding apple pie filling, I know it would be delicious. Autumn Apple butter dip as it is soft, we love apples, and right now it sounds so good!! The cherry almond crumb pie would be delicious. I'd make the Autmn Apple butter dip, I love apples. I would like to try the Strawberry Slow Cooker Scoop Cake because I love using my slow cooker and I love strawberries. I am excited to try the Cherry Pretzel Squares first. I use the cherry filling and make the Cherry Pineapple Cabana Cake (Dump Cake). Looks easy too. I would like to try the Cherry Bliss Brownies recipe because cherry and chocolate is one of my favorite combinations and this looks like a simple recipe to make. I am the pie baker in my family and every year for thanksgiving i make pecan pie, apple pie, and pumpkin cheesecake. I would love to add a new pie next year and I think their white chocolate cherry cream pie would make a great addition to the dessert table. I would love to try the Chocolate Crème Pie Filling for a creamy chocolate and peanut butter pie. In the feature, I want to try the Pumpkin as well. If I only have the option for one, the chocolate is first of course! Who doesn't like chocolate creme? The Lemony Blueberry Layered Pie looks really fab! I don't make blueberry pies so this looks like a great one to try! I should definitely get and make the blueberry pie filling (in a pie), because I haven't had them in a long time, or even thought about them till now! I would like to make the Angel Food Patriotic Delight Trifle for the fourth of July because it has red white and blue and looks delicious. I'd like to try the Cherry Bliss Brownies. They look delicious! The Mini Cherry Pecan Pies look really good. Thanks for having this contest. I would like to try the Apple Butter Pumpkin Pie because it sounds like a great combination.I think it would taste great.